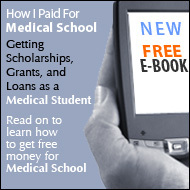 Perkins Loans provide a great option for medical students. Similar to its undergraduate counterpart, a Perkins Loan for medical students is campus-based aid given through a student's school. The funds are from both the federal government as well as the school. Therefore, they are still considered federal loans. But because the school acts as the lender, the borrower will repay the school, once he or she enters their repayment period. Since not every medical school offers the option of Perkins Loans, be sure to check with your medical school's financial aid advisor to ensure that this is an option for you. The difference between a Perkins Loan for undergraduates and medical students is the loan limit. Medical students may borrow up to $6,000 for each year of study. You may borrow as much as $40,000 during your enrollment as a medical school student, but this includes any Perkins Loans that you may have borrowed as an undergraduate student. Perkins Loans carry the lowest interest rate of any federal student loan at 5%. Another huge benefit with Perkins Loans is that they are subsidized. The government will pay on the interest that accrues on subsidized loans while the borrower is in school, in his or her grace period and while they are in deferment. This can save a substantial amount of money in interest. As with other federal loans for medical students, Perkins Loans have no prepayment penalties and have no deferment and forbearance options. Perkins Loans are unique compared to other federal loans in that they have a grace period of nine months instead of the normal six months before students will begin their repayment period. However, for medical students, repayment can be deferred for an additional two years during their residency.